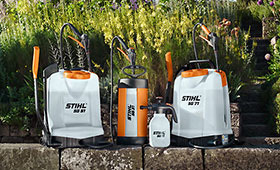 Precision is the major strength of the manual sprayers from STIHL. The SG 11 and SG 31 sprayers are suited to precise, detailed work around the home and garden. The SG 51 and SG 71 backpack sprayers are ideal for manually applying pesticides and fertilisers across medium-sized spaces.